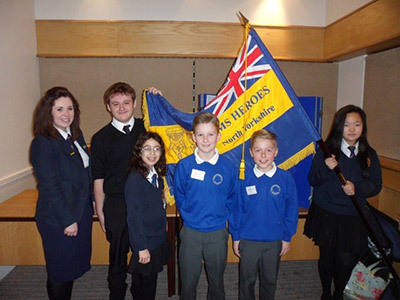 AFFILIATED with the Royal British Legion, HMS (Her Majesty’s Schools) Heroes is a unique international pupil-voice group supporting Service children and young people. Originating in Plymouth and now featuring member schools worldwide, the group exists to raise the profile of Service children and to help explain the unique challenges that go hand-in-hand with being part of a military family. School groups support each other, organise events and activities and engage in local community projects. Five schools, with only a few Service children in each, are known as the Hambleton Heroes. They have come together for joint membership, bringing their community together and giving important peer support. Sharing with others is key to giving Service children confidence to understand that they’re not unusual, and that there are likeminded friends they can turn to for support. The initiative goes far beyond peer support, HMS Heroes members act as ambassadors to provide insight into what it’s like to be a Service child – helping to bridge gaps between school staff, fellow pupils and the wider community. A recent message from Mount Pleasant Falklands HMS Heroes to the Catterick and Richmond group said: “It feels like we are part of one big school together, even though we are miles apart.